Redirect Manager is simple, portable, extendable, open source redirect tool for Episerver projects. Here's couple of examples what kind of rules are possible. It's built to be as minimalistic as possible and as an example of simple Episerver add-on. It requires only 4 files for business logic and data access, 1 controller and 1 view. Easily create redirects to any URLs or to Episerver pages. Allow moving and changing URLs of Episerver pages and the redirects still works. All redirects are HTTP 301 (Moved permanently), because search engines only follow this kind of redirects. Access restrictions allow usage of rule manager to only administrators. And the most important: It's open Source and it's yours to extend and manipulate! Solita <3 Open Source! No CSS or styling; There isn't even a single line of CSS or styling in project. Frameworks as Bootstrap give enough styles for simple solutions and it's responsive OOTB. No NuGet packaging; It's not a NuGet package because NuGet packages aren't agile enough. It's easier to copy&paste changes. No DDS; We have come to conclusion that Dynamic Data Storage isn't scalable and functional for our purposes. No Dojo Toolkit, No Dijit; Dojo framework is way too large and complicated framework for simple solutions like this. No extra controllers and models; MVC is nice concept, but controllers and models are often not important. Coding some trivial logic to views will your project more agile. 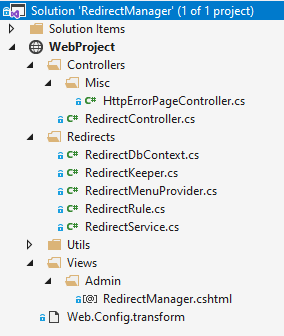 No REST; Normally we would have used AngularJS and Web API, but with administration tools it's not necessary. No Translations; Administers normally do not need localizations, so why waste of time and energy. No Unit Tests; There is no point of testing trivial things and unit testing != no bugs. Source codes are in https://github.com/huilaaja/RedirectManager and feel free to send improvements!